Another of the Mulligan label's great releases from the 1970s. From the exciting first strain of "Matt Peoples' Reel no. 1" to the epic final track of "The Graf Spee," this was an incredibly wild ride which became an instant classic. 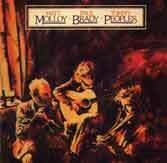 To this day it remains one of the best albums of Irish traditional music ever made. Although this is due in great part to the musical rapport and sheer genius of the two lead instrumentalists, who had played together extensively during the early days of the Dublin session scene and as members of the Bothy Band, Paul Brady's accompaniments contribute to the sense of exhilaration, and his passionate singing of "The Shamrock Shore," often imitated since, is as special as the rest of the album.